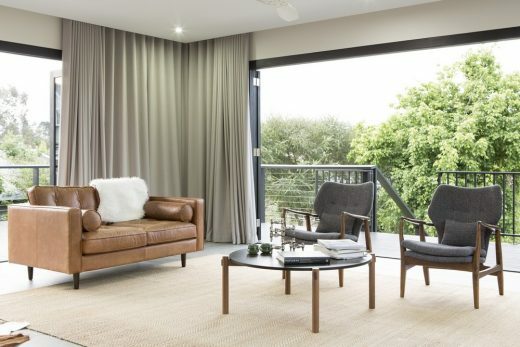 The brief given to the architects for the project was to transform a late 19th century heritage-listed four bedroom cottage in a quiet, leafy country town into a larger, light filled home for a growing family. 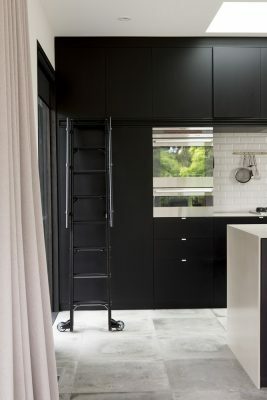 To do that, they had to connect the existing house to the garden, creating a series of flexible spaces for contemporary living & entertaining. A new kitchen/living/dining room and new outdoor living spaces totalling 165 sq metres were added, and an existing 25 sq metres converted into a secondary living room. Those Architects’ initial masterplan included the new pavilion and minor intervention to the existing cottage which was effectively Stage 1. A second stage is currently being designed. This will reconfigure the existing cottage internally, relocating the master bedroom and adding a walk in robe and ensuite. There are also plans to add a study and create storage in the four large bedrooms. Those Architects are also looking at ways to draw light in to the old part of the house. One of the challenges with this house was deciding how to connect the built form to the large garden to the rear. 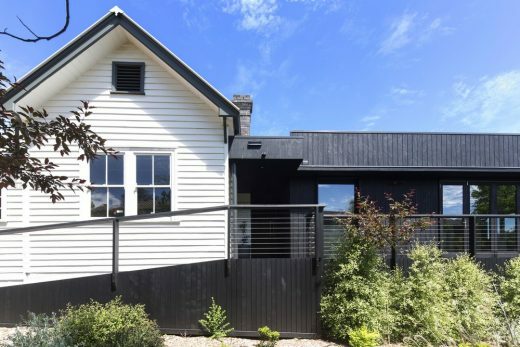 To do that the architects had to deal with a significant level change between the existing cottage floor level and the back yard, and also work out how to respectfully hitch a major addition on to the back of the heritage listed cottage. 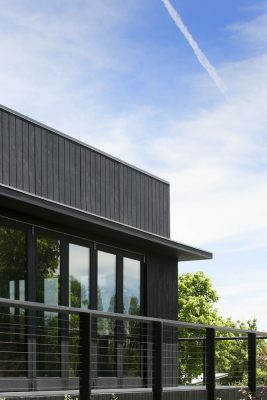 Those Architects conceived the new extension as an unashamedly contemporary ‘podium’ that would would anchor the building to the landscape, connecting the cottage to the garden, and the interiors to the sky. One of the defining characteristics of this region is the dramatic sky, which dominates your perception of the landscape, so they used the podium form to mediate the built form in between the ground plain and the vast sky, effectively using the architecture to intensify this connection. Inturn, this allowed the architects to respect the old house, essentially leaving it intact and creating a clear distinction between the two architectural forms. A spatial program was then created between the two elements as the unification method. The entry foyer now acts as that connecting device – it works programmatically for the house to separate the private areas, which are all at the front of the house within the existing cottage, and the public spaces – the living/dining/kitchen areas are arranged around a large wraparound deck which connects the internal program to the garden. 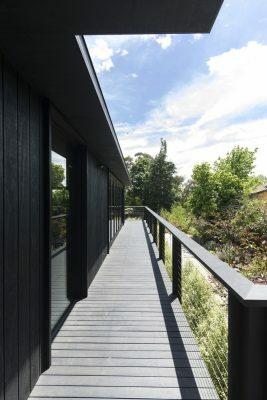 It was desirable to keep the levels consistent throughout the house so that it was easy to live in, and secondly, so that the addition would to sit ‘above’ the landscape, providing visual connection to the landscape and hills beyond from the living spaces and the deck. The rural town where the house is located, Armidale, sits in a valley. The sky, the treetops and the mountains you see from the rear part of the house is deliberate due to the way the building is elevated and sited. Movement is a primary concern in all of the work by Those Architects. Thoroughfares through a building – the way people walk through, around, up and down a building is crucial to the way it is experienced. In this case, the cottage inherited was highly compartmentalised, which didn’t allow for great circulation around and through the building. As was the convention at the time it was built, spaces were sealed off from one another – you moved up and down through the corridor, and couldn’t see beyond the room you occupied. A concern for the architects was the visual and circulatory connection between the public spaces and the back yard, and how the various spaces are used and experienced both physically and visually. 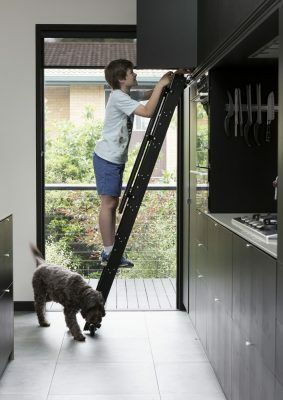 They carefully considered the activities that take place in the house and how it functions – the activities that need to take place in different spaces, at the same time – so, not having kids running through the kitchen from the rumpus room to the back yard, when you are trying to prepare a meal, and so on. All these things are critically important when considering open plan design for a house, because the ramifications of getting it wrong are of amplified. The staircase is an invitation to the back garden. 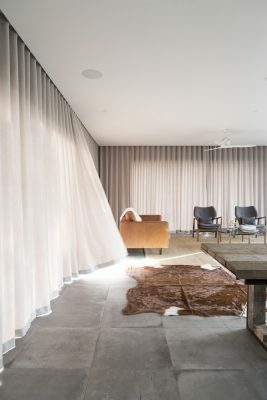 As before, the architects wanted to maintain the level change between the house and the garden, to maximise the feeling of looking out and the sense of connection to the sky. The stair is wide enough to invite you down to the back yard, but at the same time, does not intrude into the deck space. 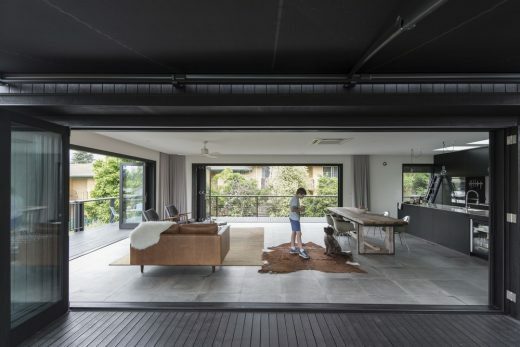 When the architects started the masterplan for this house, the clients had one six month old child – now they have two children, rapidly approaching school age. A five year old obviously has a completely different way of using space, compared to a fifteen year-old. While this family’s children are currently very young, it was important to make these spaces work as flexibly as possible as they grow and their needs change, so flexibility is important. Materials have been carefully selected to distinguish the two forms. 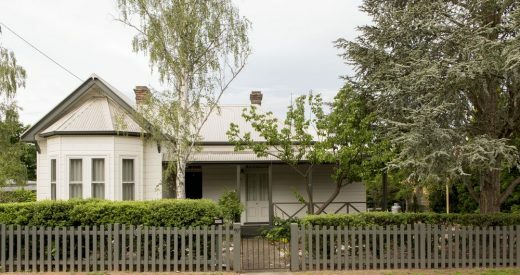 The existing cottage is clad in traditional horizontal timber weatherboards. 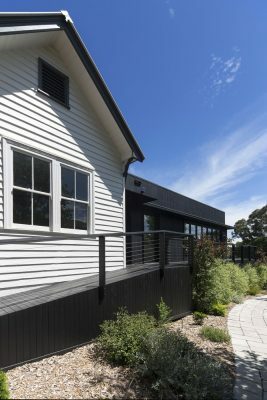 To clearly distinguish the new addition the architects simply rotated the cladding orientation 90 degrees, then inverted the colour scheme…so, the original cottage is horizontally clad and white, the new addition vertically clad and black. It’s a subtle detail, but important. 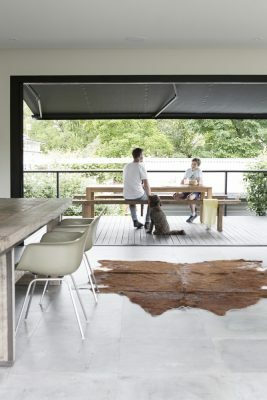 For the new extension, which obviously gets a large amount of traffic, the architects used large concrete tiles to connect the interior seamlessly through to the deck. Australian timbers were used where possible, most of them from the Armidale region. 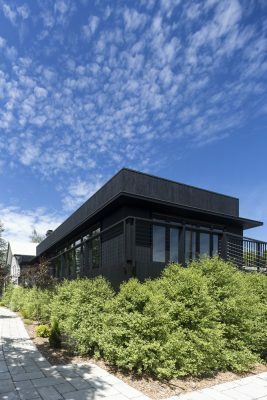 Those Architects worked with a local landscaping firm to create the garden, which is a mix of deciduous, native and evergreen trees. Including pittosporum silver sheen evergreens against the building. The idea is that visitors are forced to meander through the garden, stopping and taking pause, and connecting with the garden and the architecture, instead of a gun barrel ‘straight down the back’ kind of an approach. New England in Australia has some things in common with its namesake England, and with the New England region of the USA; deciduous trees turning rich yellows and reds before the leaves fall, steep-spired Sir Christopher Wren-inspired churches and place names lifted straight off a map of Britain, such as Stowe, Boston and New Plymouth. In the Australian New England, while you get the autumn colours and the odd inspired church, the landscape is fiercely and undeniably Australian: rocky crags, man – made dams, eucalyptus trees and quaint little towns with charming main streets. 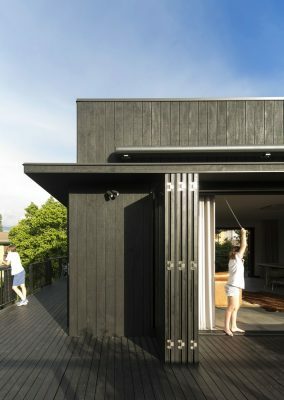 Those Architects is the Sydney based studio of Ben Mitchell and Simon Addinall. Bringing together creativity and knowledge, they believe in thoughtful enquiry into the reciprocal relationship between architecture, broader social context, landscape and the environment. Walls: Heritage brick. Timber weatherboards. Shadowclad. 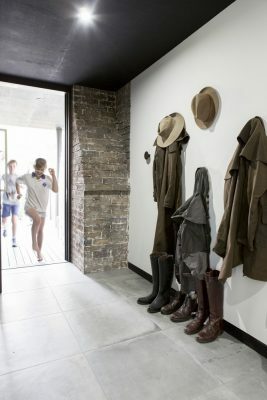 Flooring: Heritage timber floorboards. Concrete tiles. Doors and Windows: Australian hardwoods with double glazing. Joinery: Maple faced plywood, blackwashed. Lighting: LED downlights. Concrete pendant lights.